I was headed for a meeting , an interview to see if I was suitable to join a board, when I read ADG’s illustrated article. 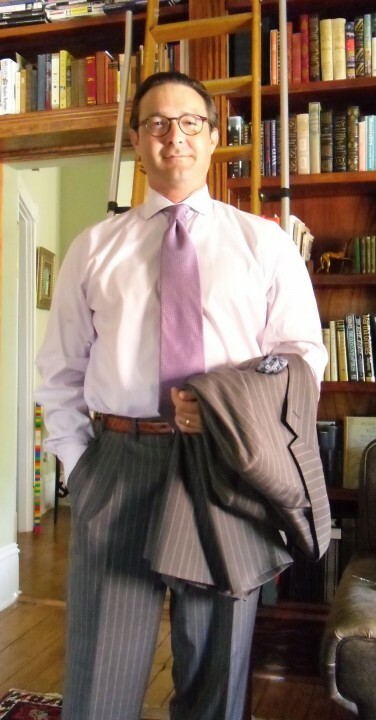 I began the day with a purple tie and a lavender striped shirt. Half an hour later, I changed the tie and pocket square. Those in the know will tell you that you should never wear more than two patterns for an interview. I had on five, counting my socks. But the title suggests that I should mention my preference for unnatural, i.e. padded, shoulders. Look at the photo above and you may see that my right shoulder is a full inch lower than my left (a common issue) and sort of turns in (fencing injuries, I believe). The corkscrew effect is most evident in the creases of my off-the-peg shirt. The defect is corrected with the extra pad added into my Canali coat. That’s why you need a good tailor, and, in my opinion, a medium amount of padding in your suit coats. 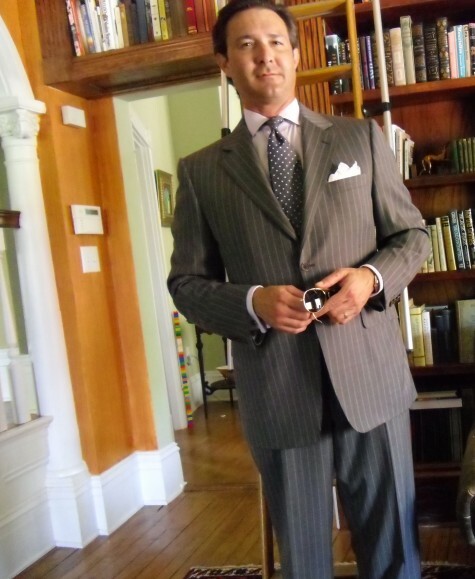 This entry was posted in Elegantology and tagged ADG, Canali, natural shoulders, padded shoulders, sit coats, tailoring. Bookmark the permalink. Chris, with your style, intelligence, and class, I am sure you were accepted on the board! great looking presentation! Why Chris, your plethora of patterns, and perfectly natural shoulders would certainly add an elegant touch to any board. The Saville Row “power chest” works for your body type, but I must admit it doesn’t work for me with my already football player-esque upper body. Your point of using tailoring to adjust clothing to your unique shape is the key take away… after the basics like hemming the trousers and sleeve lengths. Looking dapper as always! The board would be crazy to not accept you! A great combination. I hope you don’t mind if I “borrow” it. Some people are a cutter and sewer’s dream. But rarely is anyone symmetric and many are nightmares as you know, to properly fit. My slight stoop and rounding shoulders guarantee an off the peg coat to pop out at the neck. Thus the reason for driving myself towards insolvency through excessive, yet neck-shoulder hugging perfection…clothes. Man, I feel that if I looked half as good as you, I’d be making a lot more progress in life. Keep up the good work! In my experience it helps to add a customized shoulder pad under the sloping shoulder. I prefer that over having the entire suit altered. Were you accepted to the board? Sir: I’m the “Richard M” that ADG so kindly gave credit to for my help with that article. I do enjoy your blog and style sense. Don, I just saw this comment. Just as showing up is half the battle, looking the part can take you far. You can begin anytime.